As we get older, our activity levels can change, as does our range of motion. Older adults are encouraged to exercise, but what does that look like for someone who may be in a wheelchair, rely on a cane, or suffer from arthritis pain and stiff joints? While running a marathon may no longer be possible – though for some it might – it’s important to remember staying active is within everyone’s reach. Regardless of age or mobility, staying active can help improve emotional well-being and overall physical health, as well as reduce the risk for falls or other serious injuries. Use our suggestions below to encourage older loved ones to find ways to stay active and social activities they enjoy, as well as connect with peers in the community. There are many levels of activity that range from social interaction all the way up to walking or jogging regularly. We think of them in three categories: simple activities, active exercise, and social activity. Simple activities focus less on working up a sweat and more on improving or maintaining mobility. Older adults who use a wheelchair or other mobility aid can perform simple movements like these every day to keep their joints loose and reduce the pain and stiffness of arthritis or a sedentary lifestyle. Active exercise can help your loved one maintain better balance, reduce the risk for falls, and lose weight, which can help reduce body pain. Simply walking at a modest pace for 10 to 20 minutes, three to five times per week, can help improve blood pressure, blood sugar, mobility, and weight. In fact, losing just one pound reduces pressure on the joints by as much as four times. For example, losing five pounds of weight is the equivalent of reducing stress to your joints by 20 pounds. 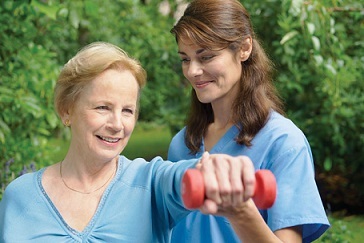 Senior centers and gyms often provide fitness classes and programs for older adults. 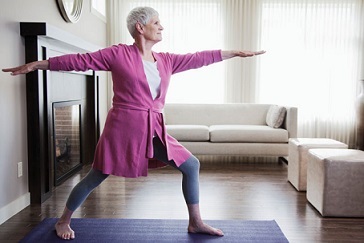 These activities are designed for a range of activity levels and likely offer modifications if a person has low flexibility or trouble with balance. Group activities are great for people of all ages and for seniors in particular. Exercising with a friend or a group makes us more inclined to keep attending, and the social interaction is an additional boost to emotional well-being. From chair aerobics to more active stretching activities such as yoga or tai chi, there are many activities to choose from. To stay active at home, we recommend checking out the vast resources online. There are many free senior fitness regimens and videos online, as well as healthy living communities on social media. Mobility or pain issues can make socializing difficult. But enjoying time with friends, family, neighbors, and people in the community is worth the effort. Regular interaction with others outside the home can help your loved one feel less isolated and can increase mood, self-esteem, and emotional well-being. The first step should be to check in with your loved one’s doctor. This is particularly important if your loved one has an underlying condition such as diabetes or high blood pressure, or an internal medical device, such as an insulin pump or a pacemaker. The doctor will recommend activities that are safe to engage in, as well as those to avoid, and how to approach them safely. Next, we recommend purchasing appropriate shoes, even for simple activities. As we age, we lose some of the fatty padding in our feet, which makes foot pain and discomfort more likely during activity. Look for a shoe with a supportive base and cushioned lining to prevent foot pain and blisters. People with diabetes should take special note of this because they are more at risk for ulcers and foot sores due to neuropathy, or lack of feeling in the feet. Finally, offer to get active with your loved one. Practice chair exercises or meet up to walk and talk together. This is a good time to enjoy each other’s company, as well as check in on their physical and emotional health and needs. Getting active shouldn’t be overwhelming. There are simple things you can do in your community to help your loved one move more, face less pain, and interact with others.